In May 2012 the Norwegian Union of Municipal and General Employees (NUMGE) and Norwegian People’s Aid (NPA) published a report demonstrating that Norwegian authorities and companies, through financial investments and trade, are involved in activities that contribute to Israel’s breaches of international law and human rights. The report further revealed how groups in Norway give direct support to the occupation by means of monetary transfers to individual settlements. 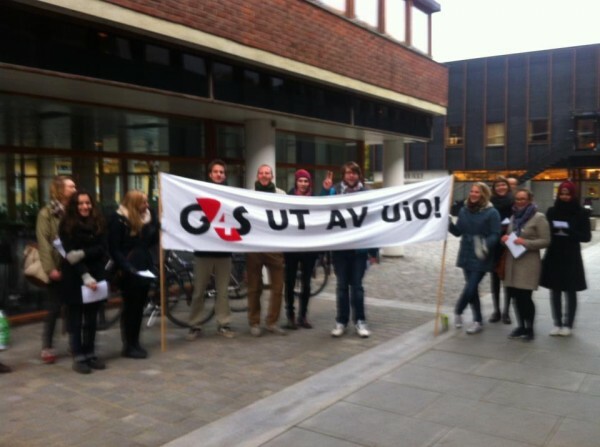 Since August, student activists from the Palestine Committee at the University of Oslo have been campaigning against the University’s leadership to renounce the coming renewal of the contracts it has with security company G4S. Early this morning, a group of activists from the Palestine Committee of Norway blocked the entrance to the offices of the security firm G4S in Oslo. The activists demanded that G4S stop all activities that contribute to the occupation of the West Bank and Gaza.